James F. Entwistle was sworn in as the Ambassador to the Federal Republic of Nigeria on October 28, 2013. From 2010-13 he served as U.S. Ambassador to the Democratic Republic of the Congo. As a career member of the Senior Foreign Service (Career Minister) he served as the Deputy Chief of Mission at the U.S. Embassy in Bangkok, Thailand from July 2007 until June 2010. From 2003-06, Mr. Entwistle served as Deputy Chief of Mission at the U.S. Embassy in Colombo, Sri Lanka with simultaneous accreditation to Maldives. Mr. Entwistle joined the Foreign Service in January, 1981. He served in Yaounde, Douala and Niamey from 1981-86. From 1986-90 Mr. Entwistle was a watch officer in the Bureau of Intelligence and Research and the desk officer for Kenya and Uganda in the Bureau of African Affairs. From 1991-94, he headed the Refugee Assistance Unit at Embassy Bangkok with extensive travel to Cambodia. After serving as Deputy Chief of Mission in Bangui 1994-95, Mr. Entwistle worked in the Bureau of Consular Affairs in the Department until his assignment as Counselor for Political Affairs at the U.S. Embassy in Kuala Lumpur, Malaysia 1999-2003. Mr. Entwistle is a graduate of Davidson College in North Carolina. His foreign languages are French and Thai. He is married to Pamela G. Schmoll. They have two children. Terence McCulley is a career member of the Senior Foreign Service, with the rank of Minister-Counselor. He was the Deputy Chief of Mission at the U.S. Embassy in Copenhagen, Denmark from 2008-2010. Prior to this posting, he served as U.S. Ambassador to the Republic of Mali from 2005-2008. From 2004-2005, he worked at the State Department in Washington, helping to coordinate reconstruction efforts in Iraq. He has been the Deputy Chief of Mission at the U.S. Embassies in Togo, Senegal, and Tunisia and also served as Consul in Mumbai, India. Joining the Foreign Service in 1985, Mr. McCulley started his career in Niger, followed by assignments in South Africa and Chad. Returning to Washington in 1993, he worked for two years on Central African affairs. He is the recipient of four Department of State Superior Honor Awards. Mr. McCulley was born in Medford, Oregon, and grew up in Eugene, where he graduated with a Bachelor of Arts degree in European History and French Language and Literature from the University of Oregon. As a Rotary Foundation Graduate Fellow, he studied political science at the Université de Haute Bretagne in Rennes, France. In addition, he attended the Fletcher School of Law and Diplomacy. McCulley is fluent in French. Married to Renée McCulley, the couple has two sons. 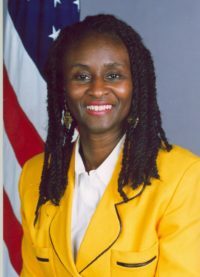 Robin Renée Sanders, a career member of the senior Foreign Service, arrived in Nigeria in December, 2007. Most recently, she served as International Advisor and Deputy Commandant at the Industrial College of the Armed Forces in Washington, D.C. Prior to this position, she served as the U.S. Ambassador to the Republic of Congo (2002-2005) and as Director for Public Diplomacy for Africa for the State Department (2000-2002).She served twice as the Director for Africa at the National Security Council at the White House; and was the Special Assistant for Latin America, Africa, and International Crime for the Undersecretary for Political Affairs at the State Department (1996-1997). Ambassador Sanders holds a Doctor of Science Degree in Information Science and Communication from Robert Morris University, Masters of Art degree in International Relations and Africa Studies, and a Masters of Science degree in Communications and Journalism from Ohio University. She also holds a Bachelor of Arts degree in Communications from Hampton University. Dr. Sanders is the recipient of the Joint Chiefs of Staff Civilian Honor Award; three State Department Superior Honor Awards; four State Department Meritorious Honor Awards; the “President Merit of Honor Award” from the Republic of Congo, and several citations in Who’s Who of America. She is a national board member of Operation Hope – a non-profit organization focused on empowerment of at-risk communities. 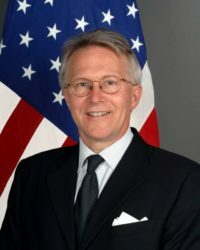 Effective July 19, 2007 Ambassador Robert E. Gribbin served as Chargé d’Affaires of the United States in Nigeria in the period after the departure of Ambassador Campbell and prior to the arrival of his successor. Ambassador Gribbin has served in fifteen African nations during the past thirty-five years, including short assignments as chief of mission in Burundi, Chad, Djibouti and Mauritius. Prior to retirement he was the U.S. Ambassador in Rwanda (1995-1999) and ambassador in the Central African Republic (1992-1995). He has been a member of four American delegations to the UN Human Rights Commission and twice to the United Nations General Assembly. He is the author of a memoir entitled In the Aftermath of Genocide: the U.S. Role in Rwanda. Ambassador Gribbin is from Tuscaloosa, Alabama. He received a BA from the University of the South, Sewanee, Tennessee and an MA from the School of Advanced International Studies in Washington, D.C. He was a Peace Corps Volunteer in Kenya and has driven the length and breadth of Africa from Cape Town to Tangiers. He and his wife Connie have two adult sons and one grandson. Ambassador Campbell was sworn in as Ambassador to Nigeria on May 18 and arrived at post on May 20. His most recent previous assignment was as Deputy Assistant Secretary in the Bureau of Human Resources. A career Foreign Service Officer since 1975, his overseas postings included Lyon, Paris, and Geneva, and he served as Polcouns at Lagos, Nigeria (1988-1990) and Pretoria/Cape Town, South Africa (1993-96). Assignments at the Department have included Dean, School of language Studies at the Foreign Service Institute, Deputy Executive Secretary, Director of UN Political Affairs in IO, and P staff. Ambassador Campbell was born in Washington, D.C. in 1944. He earned the BA and MA degrees from the University of Virginia and Ph.D. from the University of Wisconsin in 1970. He was a 1990-91 State Department Senior Fellow at the Woodrow Wilson School, Princeton University. From 1970 to 1975 he taught British and French history at Mary Baldwin College, Staunton, Virginia. 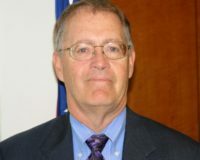 Mr. Furey has been Deputy Chief of Mission at the U.S. Embassy in Abuja, Nigeria since November 2004. His most recent assignment was as Consul General at the U.S. Embassy in London, England. Joining the Foreign Service in 1975, Mr. Furey started his career as a consular officer in Belize City in Central America. He then worked in the Bureau of Intelligence and Research in the Department of State, followed by an assignment as a political officer at the U.S. Embassy in East Berlin. Most of Mr. Furey’s assignments since then have been as a consular manager, including tours in Kathmandu, Nepal; Johannesburg, South Africa; Bombay, India; Bangkok, Thailand; and Mexico City, Mexico. He also served several assignments in the Bureau of Consular Affairs and as a Desk Officer for South Africa in the Bureau of African Affairs in the State Department. Prior to London, Mr. Furey was Consul General and Acting Deputy Chief of Mission at the U.S. Embassy in Riyadh, Saudi Arabia. Mr. Furey was born in Portland, Oregon in 1951 and grew up in Lake Oswego, a suburb of Portland. He received a B.A. in International Relations from American University in Washington, D.C. in 1973 and a M.A. from the Fletcher School of Law and Diplomacy at Tufts University in Medford, Massachusetts, in 1975. He lives in Abuja with his wife Dorothy, who he met when she was a Peace Corps Volunteer in Belize and who is from Minnesota. They have two daughters — Allison, who is a student at Bard College in New York; and Sarah, who is attending high school in Switzerland. 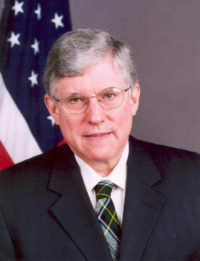 Howard F. Jeter served as Deputy Assistant Secretary for African Affairs from June 1999 until July 2000. Previously, Ambassador Jeter was Director of West African Affairs from September 1997 until June 1999, and also served as the President’s Special Envoy for Liberia. Recently, Ambassador Jeter has focused on promoting peace and reconciliation in Liberia and Sierra Leone. He has also been intimately involved in developing U.S. policy toward Nigeria, with special emphasis on supporting an enduring transition to democracy and prosperity. Prior to becoming the Special Presidential Envoy for Liberia in July 1996, he served with distinction as the U.S. Ambassador to Botswana from 1993 to 1996. Ambassador Jeter, a career diplomat, was Deputy Chief of Mission in Namibia from September 1990 to July 1993. During that period, he also served as Charge d’Affaires, following the departure of the incumbent Ambassador in September 1992. Before going to Namibia, he was Deputy Chief of Mission and later Charge d’Affaires in Lesotho. He also held various political, economic, commercial, and consular positions in U.S. Embassies in Mozambique, Tanzania, and in the Temporary Liaison Office in Windhoek, Namibia. In the Department of State, Ambassador Jeter served in the Bureau of Oceans, International Environmental and Scientific Affairs, where he specialized on issues dealing with the Law of the Sea. He is the recipient of the Presidential Meritorious Service Award, State Department Superior Honor Awards and Senior Foreign Service Performance Awards. Outside, he has received the Rainbow/PUSH Coalition Charles Diggs Award for the Promotion of U.S.-Africa Policy and the prestigious Bennie Trailblazer Award from Morehouse College. Ambassador Jeter’s languages include Portuguese, Swahili and French. Ambassador Jeter holds a BA Degree in Political Science from Morehouse College in Atlanta, Georgia, a MA in International Relations and Comparative Politics from Columbia University, and a MA in African Area Studies from the University of California, Los Angeles. Ambassador Jeter is a former Ford Foundation Doctoral Fellow, International Fellow at Columbia University, Merrill Overseas Study-Travel Scholar, Legislative Intern in the Georgia House of Representatives and a participant in Operation Crossroads Africa. He is a member of Phi Beta Kappa, the American Foreign Service Association and the Council on Foreign Relations. Ambassador Jeter was born in South Carolina on March 6, 1947. He and his wife, Donice, have two children, Malaika and Jason. 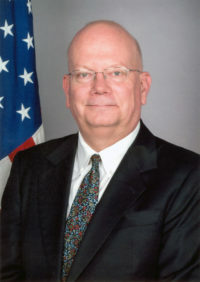 Roger A. Meece assumed his position as Charge d’ Affaires for Nigeria on September 4, 2003. Previously, he was the Ambassador to the Republic of Malawi. Ambassador Meece has served extensively in Africa, beginning with service as a Peace Corps Volunteer in Sierra Leone in the early 1970’s. He subsequently worked in Peace Corps staff assignments in Washington, Niger, Cameroon, and the Republic of Congo (Brazzaville), culminating with an appointment as Peace Corps Country Director in Gabon. Mr. Meece joined the Department of State in 1979. His foreign service assignments have included tours as Deputy Chief of Mission in Brazzaville (Republic of Congo), Kinshasa (Democratic Republic of Congo), as Consul General in Halifax (Nova Scotia, Canada), and in the U.S. Embassies in Cameroon and Malawi. In Washington, Mr. Meece has served in the Bureau of International Narcotics Matters, on detail to the Office of the Vice President, and most recently, as Director for Central African Affairs at the State Department. He is fluent in French. Ambassador Meece received a Bachelor of Science degree from Michigan State University and as a Foreign Service Officer, attended the National Defense College of Canada for one year. He is from Seattle, Washington. William H. Twaddell of Rhode Island and Providence Plantations presented his credentials as Ambassador to the Federal Republic of Nigeria in December 1997. He is a Career Member of the Senior Foreign Service. Ambassador Twaddell joined the Foreign Service in 1969 and was assigned to Dhahran, Saudi Arabia as Vice Consul. Later, he served as a Commercial Officer at the embassy in Caracas, Venezuela. He returned to Washington as a petroleum analyst, and was later assigned to the Department’s Executive Secretariat. He joined the “Transition Team” in 1976, and subsequently worked as a Special Assistant to Secretary of State Cyrus Vance until 1979. After his Washington assignments, Ambassador Twaddell became Deputy Chief of Mission in Maputo, Mozambique where he served for 3 years as Interim Charge d’Affaires until 1983. After Maputo, he served at the Coast Guard Academy faculty. That assignment was interrupted by temporary postings as the first Director of the U.S. Liaison Office in Windhoek, Namibia in 1984, and interim Charge in Guinea-Bissau in 1985. From 1985 to 1991, he served as Deputy Chief of Mission in Bamako, Mali. The following year, he was Diplomat-In-Residence at the University of the District of Columbia and Georgetown University. From 1992 to 1995, Ambassador Twaddell served as Chief of Mission in Monrovia, Liberia. He returned to Washington in 1995 as Deputy Assistant Secretary in the Bureau of African Affairs. Ambassador Twaddell was born in Madison, Wisconsin in 1941 and graduated from Brown University in 1963. After graduation, he joined the Peace Corps and served in Brazil for 2 years. Following his tour, he served in the U.S. Army from 1965 to 1967. In 1968, he worked as a general assignment reporter for the Washington Bureau of The New York Daily News. Ambassador Twaddell speaks Arabic, Portuguese, French, and Spanish.